House for an Art Lover is both an architectural delight and an excellent wedding and event venue. It is located within the grounds of Bellahouston Park, ten minutes from the City Centre of Glasgow. Charles Rennie Mackintosh designed the building in 1901 in response to a German-based competition. He collaborated with his wife on some of the plans for the interior design of the house, too. However, it was not until 1987 that the house was actually built in the grounds of Bellahouston Park at the initiative of Glasgow engineer Graham Roxbrugh. A number of artists, builders and designers collaborated on bringing Mackintosh's plans to life, making House for an Art Lover a unique blend of historic and contemporary design. At the site, visitors can look over the house, and enjoy lunch at the Art Lovers Caf�. There is a regular programme of contemporary art exhibitions on display at the Art Lovers Caf� Gallery and a range of products and artistic gift ideas at the Art Lovers Shop. The site is an exceptional location for wedding parties and was voted one of the best UK venues for a wedding by the Independent Newspaper. With a dedicated wedding coordinator on hand to advise you every step of the way, you will be free to enjoy the beauty of this spectacular and charming setting. 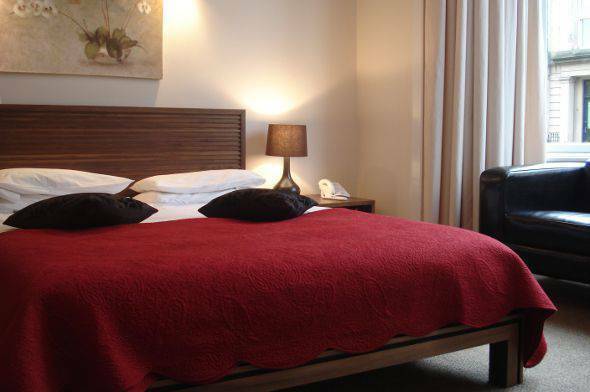 If you are staying in central Glasgow while visiting Bellahouston Park, you will find The Sandyford Hotel between the City Centre and the West End an excellent base. We are conveniently located near the M8 motorway and just a short drive from House for an Art Lover. We have 55 comfortable and well-appointed rooms with en suite bathrooms. Our B&B prices are affordable yet we do not compromise on quality. Our reception desk is open 24 hours a day for your convenience and we provide a full Scottish breakfast as part of our bed and breakfast offers. Call The Sandyford Hotel today to book your hotel near House for an Art Lover. We will be delighted to advise you on available rooms and access routes to Bellahouston Park. It is also possible to make a booking with the online reservations system on this site.